Traditional Catholic Musings: Starting to wake up? "I just read this article by Fr. Robinson, and my head is still spinning. He is very clever, but his reasoning is faulty; it is tautological and circular. Once having assumed the conclusion he finds ways of arguing for it. He sets up several false dichotomies, making it seem that he is arguing for the only possible via media. He says that Archbishop Lefebvre did not use the term "Conciliar Church." Perhaps he should read the Consecration Sermon: "This Life of Our Lord Jesus Christ is disappearing everywhere in the Conciliar Church. They are following roads which are not Catholic roads: they simply lead to apostasy." "Indeed, since the Council, what we condemned in the past the present Roman authorities have embraced and are professing. . . . Thus, we find ourselves in a case of necessity. We have done all we could, trying to help Rome to understand that they had to come back to the attitudes of the holy Pius XII and of all his predecessors. Bishop de Castro Mayer and myself have gone to Rome, we have spoken, we have sent letters, several times to Rome. We have tried by these talks, by all these means, to succeed in making Rome understand that, since the Council and since aggiornamento, this change which has occurred in the Church is not Catholic, is not in conformity to the doctrine of all times. This ecumenism and all these errors, this collegiality—all this is contrary to the Faith of the Church, and is in the process of destroying the Church. . . it is clear that the only truth that exists today for the Vatican is the Conciliar truth, the spirit of the Council, the spirit of Assisi. That is the truth of today. But we will have nothing to do with this for anything in the world!" The Archbishop never advocated any halfway measures: the Roman authority should be obeyed in some instances and in others not obeyed. He never makes the case that as long as they let him be then everything else is just fine. He wouldn't even get in the car they sent the night before! Fr. Robinson is in the car, and more than halfway across the Alps on a dark night! By a not so strange coincidence, I received in the mail today a fundraising letter from Fr. Wegner. It begins by saying: "It was tumultuous year, filled with great expectations and great confusion. . . Indeed it was a year in which so much confusion emanated from Rome that our own Bishop Bernard Fellay signed a public filial correction of the Pope for the grave errors presented in Amoris Laetitia." So far so good, but then he goes on to add to the confusion by saying: "In March, we received the surprise announcement that Pope Francis had taken the steps to remove all doubt concerning the validity of marriages celebrated by priests of the Society." I contend that this announcement was not a surprise at all, it was a pre-arranged trap. And there never was any doubt about the validity of marriages, or confessions (or the bogus excommunication!) certainly not in the mind of Archbishop Lefebvre! It is indeed a very confusing situation, and intentionally so, when the faithful are being lead to believe that we should all be waiting breathlessly for the wonders of "canonical regularization." 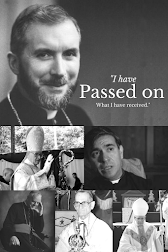 That is never what Archbishop Lefebvre sought. He said very clearly that Rome needs to explicitly reject its errors and return fully to Tradition. Pope Francis is in no way returning to Tradition, except by way of appearances as part of the diabolical dialectic. He is leading the way to the Great Apostasy. It is more obvious now than ever. To wish to be "recognized and regularized" by him is to join the ranks of the Masonic traitors who have infiltrated the Church. Pope Leo wrote the famous prayer to St. Michael the Archangel more than a century ago: "These most crafty enemies have filled and inebriated with gall and bitterness the Church, the spouse of the Immaculate Lamb, and have laid impious hands on her most sacred possessions. In the Holy Place itself, where the See of Holy Peter and the Chair of Truth has been set up as the light of the world, they have raised the throne of their abominable impiety." And one of the first acts of the Conciliar Church was to eliminate this prayer! St. Michael the Archangel, defend us in the battle and in the terrible warfare that we are waging against the principalities and powers, against the rulers of this world of darkness, against the evil spirits. Taken from the Remnant newspaper combox. Very good! I wonder if Mr. senior will still be allowed to teach at St. Mary's College after this gets out. Hopefully more will take courage from this and not be afraid to speak out.